I have always felt that Brighton is a pioneer of cuisine, I am of course hugely bias being my home town and all. But this city never fails to open my eyes, and now my children’s eyes to the big wide world of food. 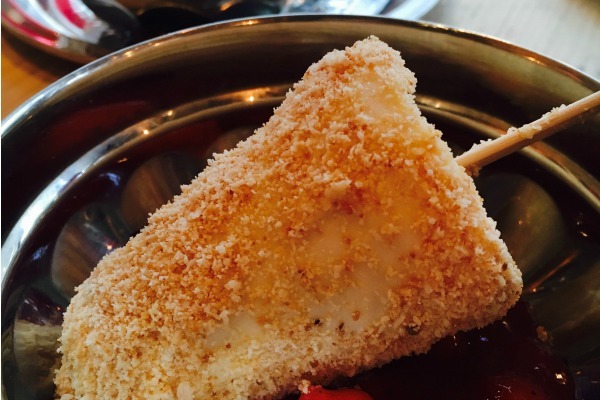 Yes kids, there’s more to dining than fish fingers. 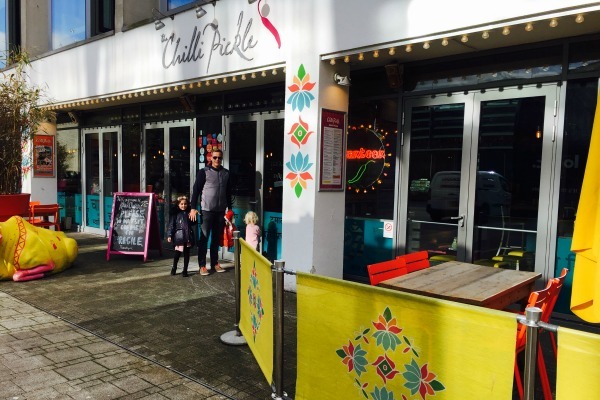 The Chilli Pickle is undoubtedly one of those flagship restaurants, in this vibrant city, where cuisines blend between continents within a few meters of each other. As a family I would say Indian food is our favourite. It’s all I ever wanted to eat during those pregnancy craving days, perhaps because of that it features very high on the girl’s “what would you like for dinner?” auto replies. It therefore gave us huge pleasure to dine a la Chilli Pickle last Sunday lunch time. We took my parents along, who have just got back from touring India – they would be the acid test. This vibrant authentic vibe captures your imagination before you are even through the door. The street selling cart decked out in bright colours stands proud outside. This theme of colour runs right through the restaurant giving off a very family friendly feel. The open plan, spacious dining room really made us relax. We felt reassured that our buggy wasn’t going to be anyone’s way, and if our girls wanted to switch seats (which they like to do A LOT) then it wasn’t going to interfere with other diners. Open shelving show cased tiffin tins, Indian icons, lanterns, various sauces to buy, along with my favourite scrubbed tables, all adding to the hang-out feel. I couldn’t help but make the comparison to a Bills Restaurant – if you have visited one of those. The memory of this meal is sending my taste buds into a bit of a frenzy. I shall try to control myself as I recall the utterly delicious, and easily, one of those most unique Indian meals we have ever had. And we’ve had a lot. As I said, our girls adore curry; this was a good starting point. 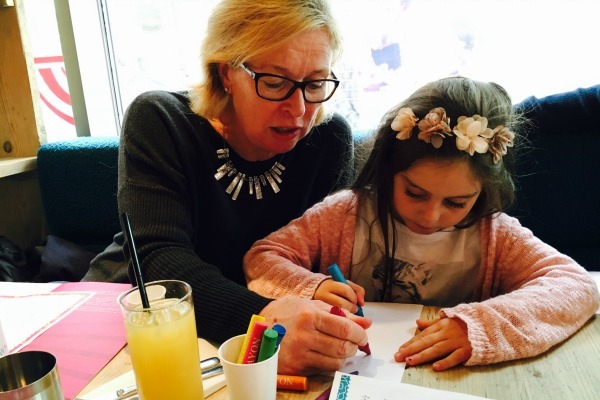 The children’s menu is as authentic as the adult one, giving an excellent opportunity for children to explore this joy of a cuisine. 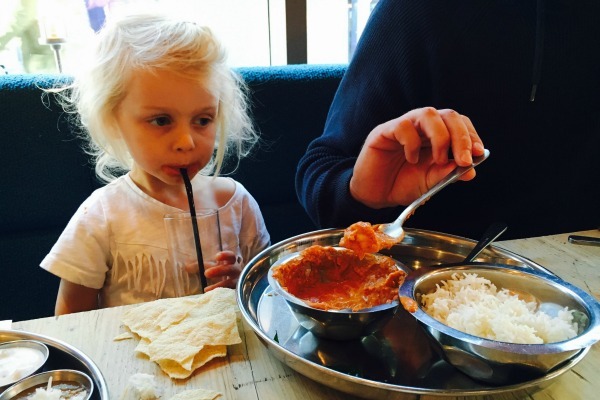 A mild Chicken Curry Thali is what they both chose, there was a vegetarian option, a Southern Indian Chicken Fry – which sounds like a delicious take on a Goujon, as well as a Kids Dosa. I had never heard of a Dosa before, the waiter ignored my ignorance with a smile and was more than happy to explain each dish. The presentation of our dishes really blew us away, even by the very high standards set by our jet set just-back-from-India- parents. You couldn’t fail to get a little excited to dive in a try the 11, that’s right ELEVEN elements on the King Thali plates. The Aubergine pickle was the stand out for me, the Korma curry was packed with chicken, full of flavour and easy on the spice. Between us we tried the Tandoori Half Chicken accompanied by Spicy fries – the Punjab way. What a twist on a chip- we all wanted to pinch more but were shooed away by their proud owner! 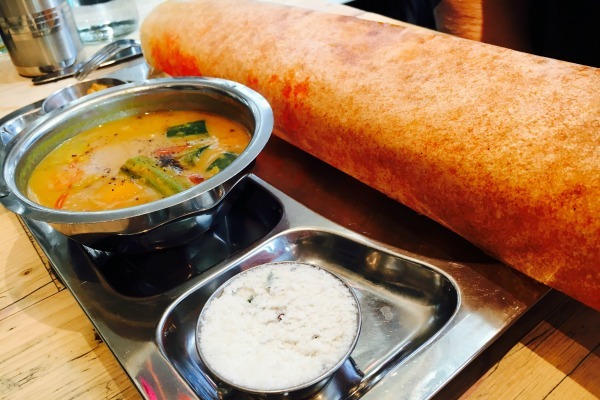 The Dosa was a sight to behold, and brought a whole new meaning to ‘a footlong’. Again, I had never seen one of these. Perhaps I live a very sheltered life, I really felt like I was learning about classic Indian regional dishes without having to open a book or reach for the dreaded phone. Our girls were fascinated to learn all about these colourful plates of food which led to a surprisingly grown up conversation. We told them about India, reeling off some differences and similarities between our cultures! Because we were in this unique Indian setting it encouraged questions about what was on the walls, and the shelves as well as what was on our plates. The activity sheet didn’t really get a look in. They were too interested in engaging with their surroundings – which is pretty much a first for our 2 & 5 year old mischief makers. Our plates were almost clean, we tried to finish, we really did. But those King Thali dishes really are made for those with king appetites. Having said that I did go ahead and over indulge in dessert. I wasn’t sure what to expect as I haven’t ever tried a truly authentic Indian dessert. Those coconut ice cream pre-packaged shells don’t count do they?! The cocktail menu was extremely tempting, an impressive list of 7 concoctions, but I had already had a glass of Sauvignon Blanc and wanted to ensure I could make it back to the car without a tipsy stumble. Coconut Cream Kulfi was a sensation. If you have a sweet tooth, then this is a must-try. It was unlike anything I have tasted before, my guess would be that it was made with condensed milk giving it that sweet, thick and oh so creamy signature. Our girls had a Mini Mango Kulfi each, which looked adorable! They gave it the thumbs up, and slumped back into their comfy banquet seats. This is our favourite family restaurant to date. 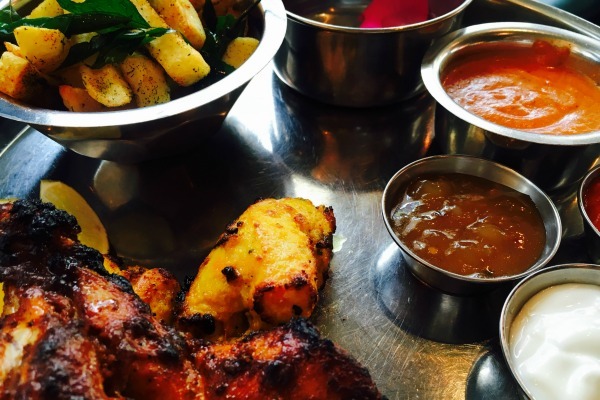 We were blown away by the variety of the dishes on offer, the relaxed authentically Indian vibe of the restaurant, and the happy, hugely helpful waiting staff. This is child friendly in every sense. 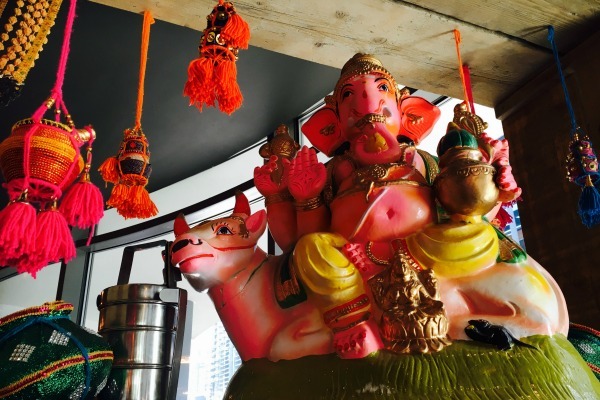 Go and immerse yourself in this vibrant culture packed restaurant. You might even learn a thing or too along the way!